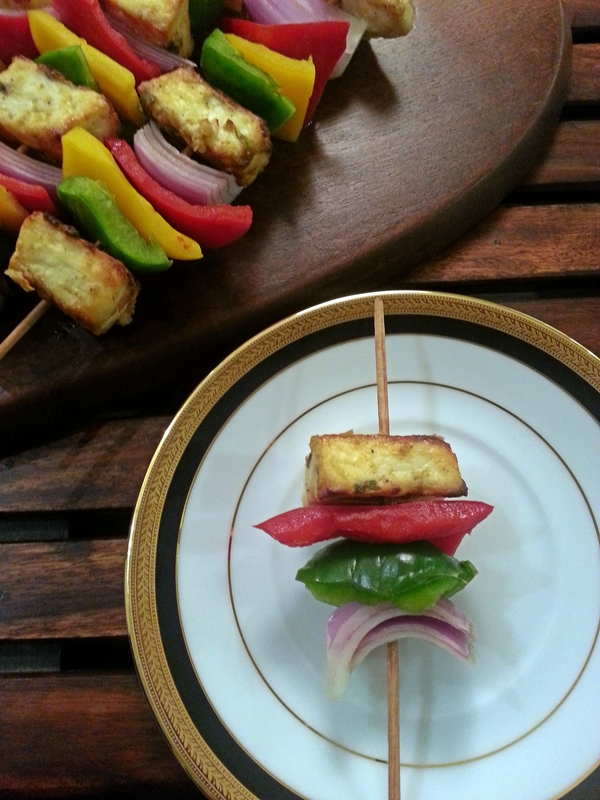 These paneer tikkas are so tantalizingly delicious, a great pre-dinner appetiser to make for a group of friends. This is a perfect starter that is neither too heavy nor has too potent flavours its a great choice for both vegetarians and non-vegetarians. Anjum has left out the ginger and garlic pastes that would usually be added to a tandoori dish as she wanted the flavours to remain delicate and light. 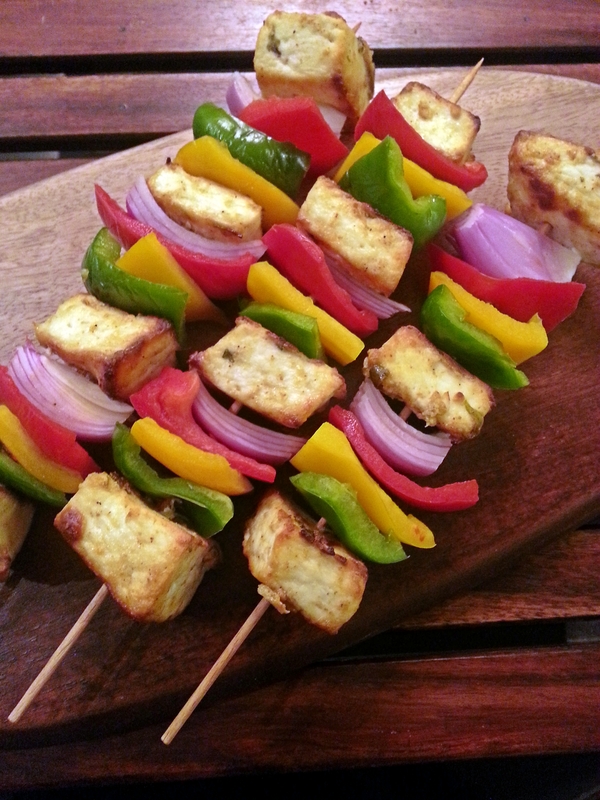 I have never added gram flour earlier to my tikkas but i did try it here and it is good, also if you r not grilling your skewers but are baking your paneer and then making the skewers then do blanch your onions and peppers well first. I ate so many of these skewers last night its unbelievable but i guess its healthy, it has paneer and veggies thats it, healthy and yummy, a definite keeper. Perfect summer dinner or pre-dinner appetiser. Blend together all the marinade ingredients with 3-4 tablespoons of water. Taste and adjust the seasoning, chillies and lemon juice to taste. Tip the marinades into a non-metallic bowl and add the paneer, very gently with your hands combine the paneer let the marinade coat it completely. Cover with cling film and leave in the refrigerator for as long as possible even over night. Preheat the oven to a 190 degree centigrade and oil a baking tray, bring the paneer back to room temperature and arrange it on the tray- the marinade is quite thick it will cling to the paneer. Place on the upper shelf in the oven and bake for 8-10 minutes, turning half way through the cooking time, baste with butter and bake for another minute or so until your paneer starts browning on the edges. Remove from heat and allow to cool slightly. 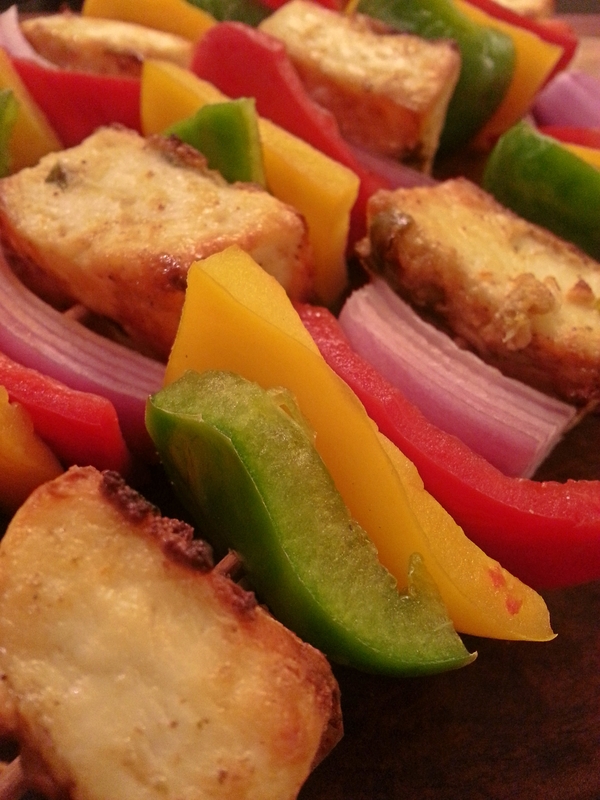 To prepare the skewers either metal or water soaked wood ones thread a piece of your paneer tikka, followed by a chunk of green pepper, a chunk of yellow pepper and a chunk of red pepper followed by an onion wedge, then repeat the pattern and finish with an additional piece of paneer tikka. 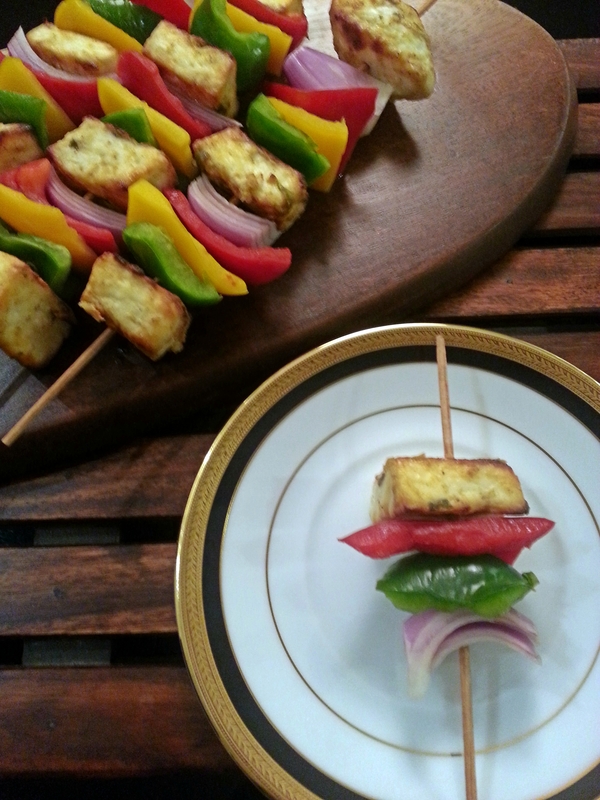 You can grill the prepared skewers over a grill when you have your friends and family around and simply bake the paneer and then assemble the skewers the way i did for a quiet dinner with your hubby and kids. If you are not grilling them then do blanch your peppers and onion well first before you start assembling your skewers.